Combretum quadrangulare is a small tree of the family Combretaceae which grows up to 10 meters in height. 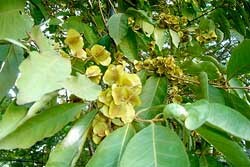 It grows in the wild or is planted in Vietnam, Cambodia, Laos, Myanmar, and Thailand. Combretum is planted along the banks of rivers or arroyos and is found throughout Thailand, especially in open, wet places. You rarely find it at the markets and it is mostly known locally. There is no supplier in the world offering Combretum, not even in origin countries, since farmers pick it for themselves. This is often the "secret ingredient" in smoking blends that have noticeable effects without any dangerous synthetics added to them. We know that "Lucid Blend" has this item in it, as well as a few others. This products is one of our favorite here at the shop, but it never seems to quite gain the fan base and respect we feel it deserves. Try it; you might surprise yourself. And, if you're not happy, our Combretum is of course covered by our 100% Satisfaction Guarantee.